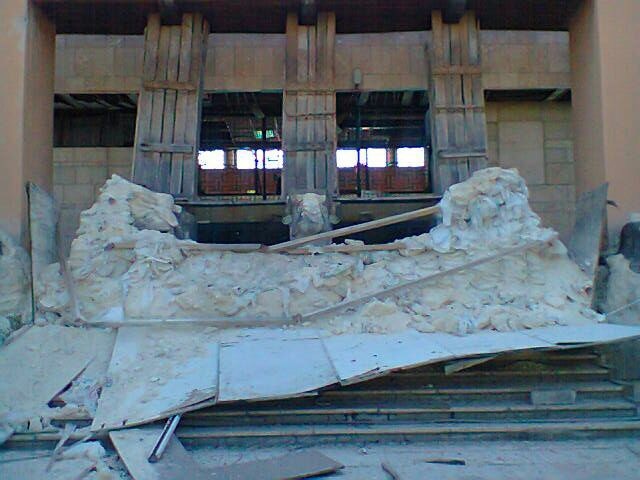 On July 13th, and then again on the 24th the DGAM reported significant new damage to the National Museum in Aleppo. Read more on this here and here. The 2016 UNESCO State of Conservation reports from the World Heritage Committee meeting are all available on the World Heritage Site website. Each Syrian site is listed in the same report, so we’ve only provided the link to one (Palmyra). The UNESCO Report of the Unesco Rapid Assessment mission to the World Heritage site of Palmyra (Syrian Arab Republic ), 23–27 April 2016 is also available at that link. On July 14 the DGAM reported damage at Tel Taban. For more information click here. ASOR CHI Co-Investigator Amr al-Azm reports that archaeological site of Shinshara in Jabal Zawiya, a UNESCO designated World Heritage Site (Dead Cities) was hit by an airstrike. Details here. A mortar attack hit the Sham Moon restaurant, in the Old City of Damascus Bab Touma Christian quarter, photos here. On ASOR CHI Weekly Report 99/100 (June 22 – July 5). At least 15 mosques in the city of Fallujah, Anbar Governorate were damaged or occupied by military forces between May 22 (the beginning of the recapture of Fallujah from ISIL militants) and June 28, 2016 (ASOR CHI Incident Report IHI 16-0019). A suicide bomber targeted the Sunni al-Nour Mosque in Abu Ghraib District, Baghdad Governorate (ASOR CHI Incident Report IHI 16-0020). An ISIL suicide bomber targeted the Shiite Imam Ahmad Shrine in Tuz Kharmutu, Salah ad Din Governorate (ASOR CHI Incident Report IHI 16-0021). A newly released ISIL propaganda video shows the destruction of Palmyrene artifacts and mummies at the Palmyra Museum (ASOR CHI Incident Report SHI 16-0043 UPDATE). New DigitalGlobe satellite imagery indicates the Russian military presence within the Northern Necropolis at Palmyra has decreased (ASOR CHI Incident Report SHI 16-0065 UPDATE). Further analysis of the airstrike damage to the Byzantine site of Qalaat Semaan, Aleppo Governorate (ASOR CHI Incident Report SHI 16-0094 UPDATE). Alleged SARG airstrikes damaged two mosques in al-Bara, Idlib Governorate (ASOR CHI Incident Report SHI 16-0095). Alleged SARG and Russian airstrikes damaged al-Iman Mosque in Quriyah, Deir ez Zor Governorate (ASOR CHI Incident Report SHI 16-0096). Alleged US-led coalition airstrikes damaged a mosque and Sufi tomb in Manbij, Aleppo Governorate (ASOR CHI Incident Report SHI 16-0097). An alleged SARG airstrike damaged al-Foqani Mosque in Hbit, Idlib Governorate (ASOR CHI Incident Report SHI 16-0098). Alleged SARG and Russian airstrikes damaged five mosques in Aleppo Governorate (ASOR CHI Incident Report SHI 16-0099). Alleged SARG and opposition shelling damaged three mosques in Aleppo, Aleppo Governorate (ASOR CHI Incident Report SHI 16-0100). Alleged opposition shelling damaged St. Demetrius Church in Aleppo, Aleppo Governorate (ASOR CHI Incident Report SHI 16-0101). ASOR CHI Weekly Report 97/98 (June 8 – June 21). Neil Brodie examines the trafficking of Syrian antiquities out of the country here. International Affairs Review have published a fairly comprehensive analysis of ISIL and Illicit Antiquities Trafficking, available here. The DGAM have visited a number of sites to assess the damage to them in the Qamishli and Al-Malkieh regions, including Tell Mozan, which is in ‘excellent’ condition, thanks to the work of the local community (which you can read more on here). To read the DGAMs report, see here. Syrian refugees in Canada held a heritage festival to celebrate and share Syrian heritage, here. The EC is cracking down on eight of its members over cultural trafficking regulations. Read more here. Dutch Leiden University sets up the (provisionally titled) Project Raqqa following a direct request from The Syrian DGAM. By combing archives, they aim to create a comprehensive object database of the objects in the national museum. 3) To contribute to post-conflict academic, historical, and heritage institutional rebuilding in Syria. ASOR Cultural Heritage Initiatives has published bibliographies for certain sites in Syria, such as Dura Europos and Palmyra. See here for more details. The Andrew Mellon Foundation has awarded nearly $150,000 to the Council on Library and Information Resources to create a Digital Library of the Middle East (DLME). To learn more see here. The German Archaeological Institute started working with the Museum of Islamic Art in Berlin early on in 2012 to digitize its archives. Meanwhile, we have managed to process more than 100,000 photos, plans and drawings concerning Syria. Of course, they are also available for our Syrian colleagues. The Syrian Heritage Archive Project is now being flanked by a project sponsored by the Archaeological Heritage Network entitled “Zero Hour – A future for the time after the crisis”. The basic aim of the project envisages building up capacities whilst planning for possible reconstruction work, not only in Syria but also in the areas of Iraq that have been affected by IS destruction. Specialists will be trained to carry out building documentations and damage assessments. At the same time they will be planning the necessary conservation and restoration measures. The ancient city of Aleppo, which is a UNESCO World Heritage site, has been made inhabitable again through work carried out since the 1990s by the German International cooperation organization GIZ. As a result, within the “Zero Hour” project the GIZ will be linking up with the rehabilitation of the ancient city of Aleppo. But experts will also be trained for other fields, such as museums and conservation. UNESCO has condemned the damage to the Aleppo Museum, and called for the cessation of damage to cultural heritage. Read it here. Apollo Magazine on the UN Statement. Rudaw on the UN Statement. Syria For All discuss their plans for Syria’s future. This began with the U.S. Department of State hosting fifteen officials from the Middle East and North Africa region as part of the International Visitor Leadership Program (IVLP) to explore strategies that prevent the destruction, looting, and trafficking of cultural heritage. The program provides opportunities for the creation of partnerships and networks with U.S. museums, academic institutions, non-governmental organizations, U.S. law enforcement agencies, and other entities that protect and preserve cultural property. Once the looted objects are seized, they are considering how best to return them, and aid in rebuilding the museums. In the best article published recently, Marwa al-Sabouni discusses the role of architecture in Syria’s war. See the TED talk here. The Recorder considers what can be salvaged from Palmyra. TASS reports that the Baalshamin Temple at Palmyra could be restored. Interview here in the Deutschland.de on the work of the German DAI to protect Syria’s heritage.